Family run bar/restaurant in fishing village of Tarcoles. 30 year well established business, popular with the locals and recently renovated. 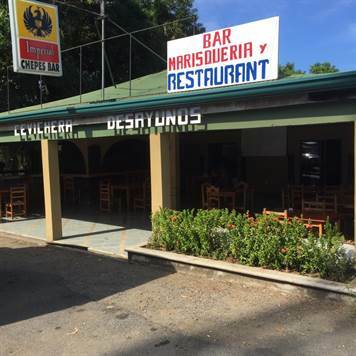 Corner location, handy access to the Costanera (Highway 34). 300 meters to the Co-operativa Fish Market and the ocean. 1 hour from SJ Int’l Airport. New Int’l Airport planned for Orotina will be within a half hour drive. Just 15 minutes to Herradura, Marriott Resort and 20 mins to Jaco. 5 minutes to Carara Biological Reserve, 10 mins to Crocodile Tour, 20 minutes to Rainforest Aerial Tram and Zipline. Potential to expand present bar/restaurant area. Tables, chairs, kitchen equipment included in sale. Includes a 3 bedroom house and a separate garage.